You ever hear the phrase- I wish video games would go back to the golden age of gaming-? Maybe you have thought this to yourself at times, getting tired of the same old rehashes every year. Well, the difference here is that my so called “golden age of gaming” would most likely be a time where some are too young to remember, or maybe not even born at the time! But I will say there are games that stand the test of time, and hold up even when the younger generation decides to give it a go, complete with old-timey graphics and all. I enjoy seeing this, and often wonder about the love for all of those games, and how developers now are showing that love. 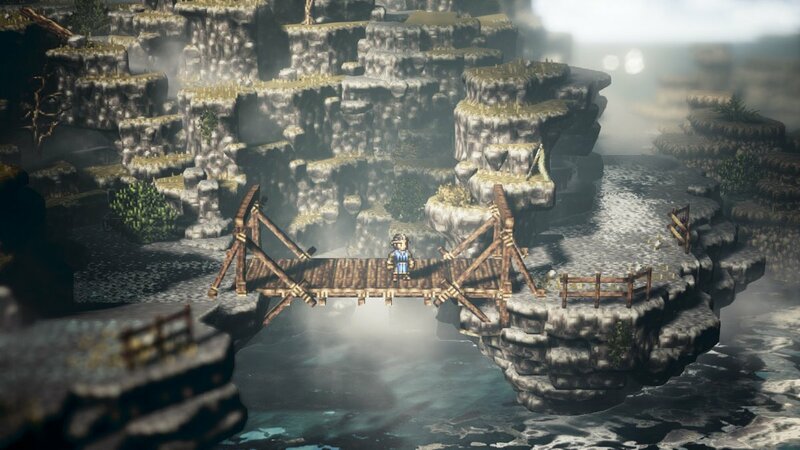 Octopath Traveler is one huge example of this, letting Square Enix guide Acquire Games into crafting a newer rpg that will stand the test of time, all in the old vein of Square. Right from the start, you can see the opening title screen, and hear a nice little tune that feels a little familiar. So many pixels that overlap a bit with some really nice set pieces, fine tuned with the power that the Nintendo Switch provides. But right now, you need to pick a starting character. Familiar classes can be seen right from the start, such as Olberic a noble swordsman who has lost his reason to swing his sword. 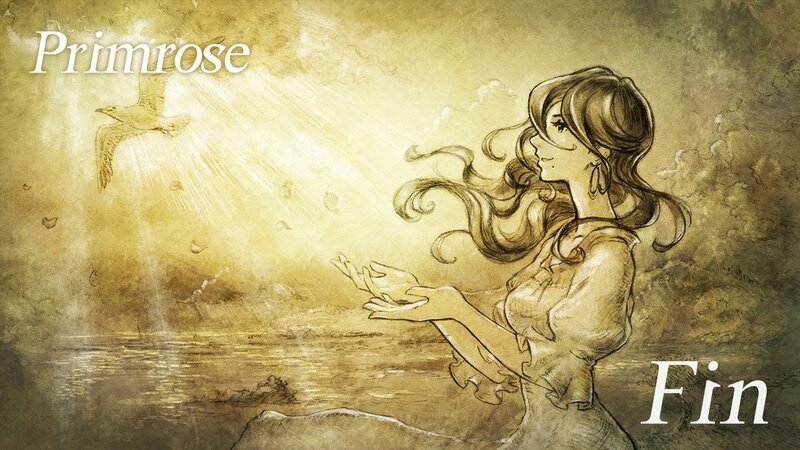 Which is the first character I picked in Octopath Traveler. 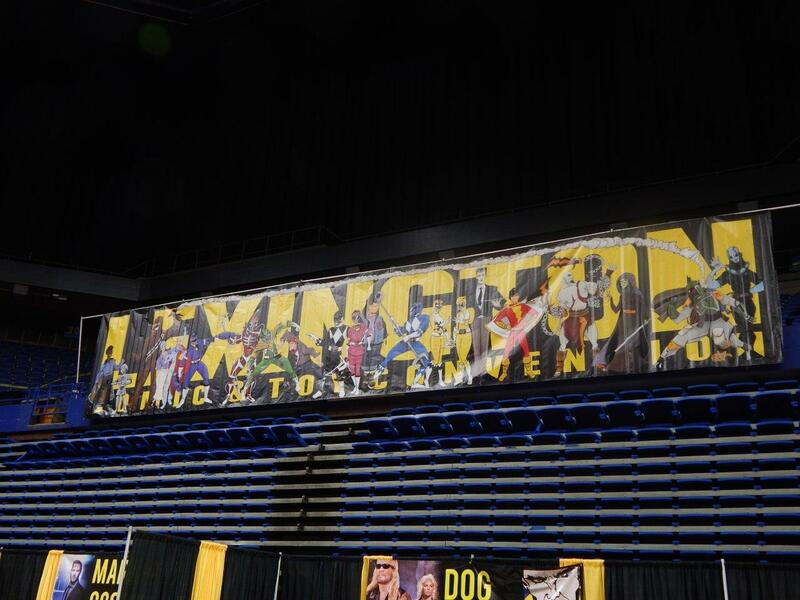 One of- you guessed it- eight playable characters. Immediately my mind goes to SaGa Frontier, an old PS1 rpg(also by Square) that lets you pick different characters that all somehow interact with each other during the layout of the story. 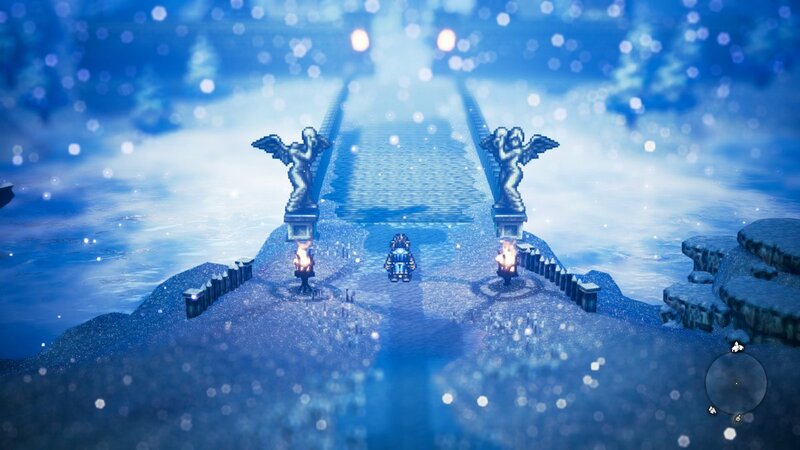 But that is about the only thing Octopath Traveler has in common with SaGa Frontier, is that there are multiple starting characters. 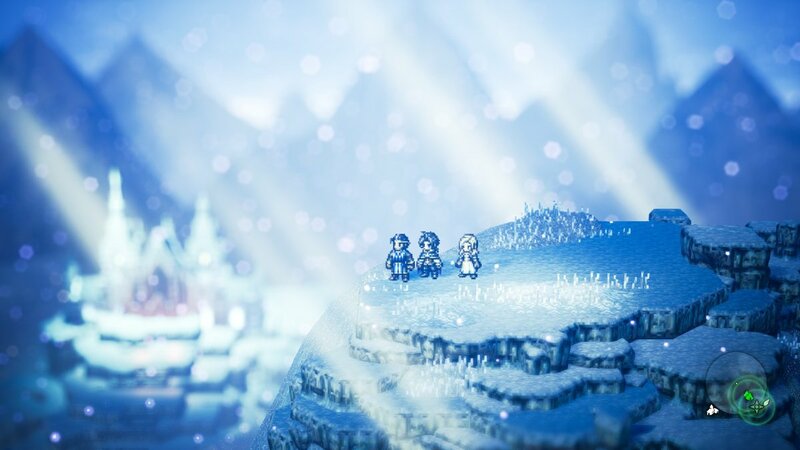 Octopath is more Final Fantasy VI meets Bravely Default(also another Square game for the 3DS), and that’s a good thing. 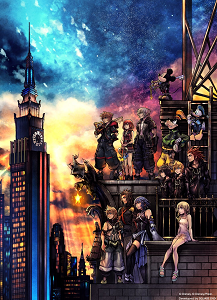 Each of the game’s eight characters all start at chapter one. Easy enough. 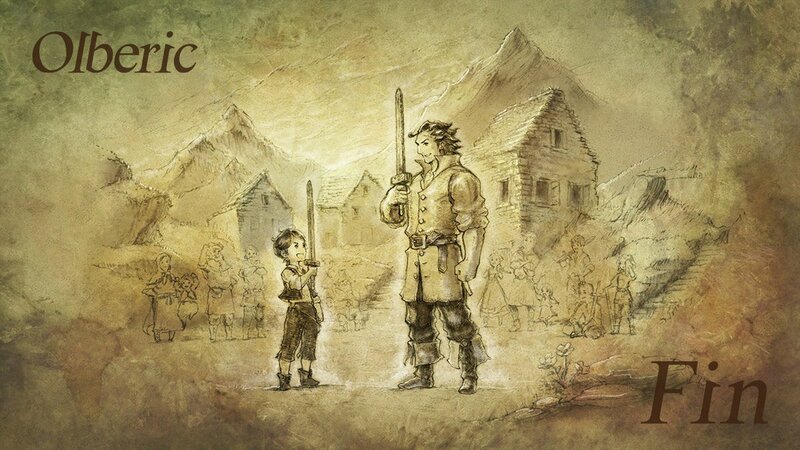 As I stated, I picked Olberic, so I get to see how his story starts. 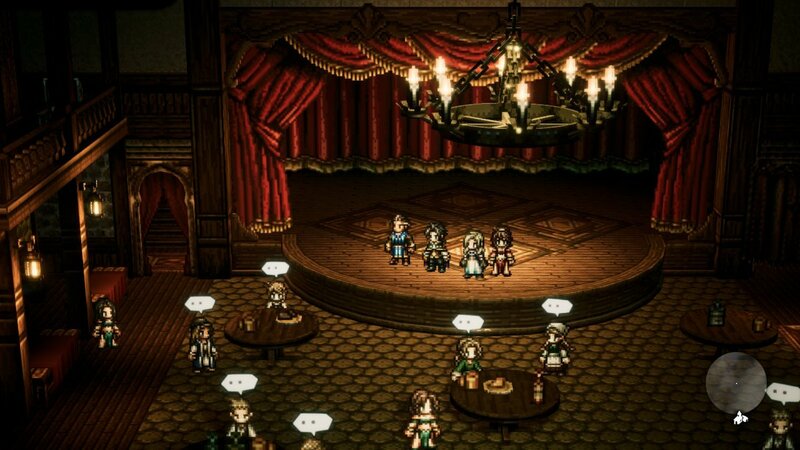 Octopath has some spoken dialogue, and it really lends to the whole- newer game, older feel- and most of the time, it is welcomed. Olberic is all about honor and justice, but after events unfold, time moves forward and we control Olberic, it seems he has lost his way a bit. Sure, he is still all about honor, but he has no direction in life. A child in town gets abducted by bandits. It’s go time. The way you traverse each area almost feels like a pop up storybook, and I love it. I’m going around, opening random treasure chests, and bam! Random battle time. The bread and butter of this game is the battle system. 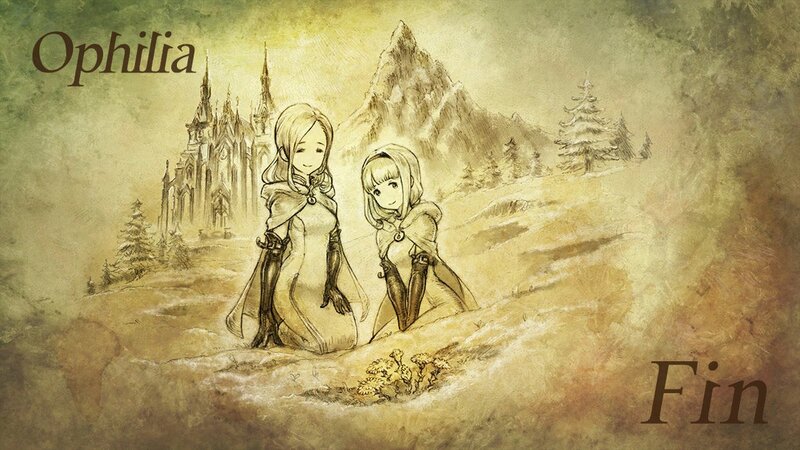 As I mentioned above, this game feels a lot like Bravely Default. The battle system is very similar, allowing you to “boost” instead of “brave”. When your turn comes up, you get a little dot above your name that you can stack up, to boost your turn, allowing for more attacks, or stronger magic in one turn. Each enemy has certain weaknesses you have to figure out, as well as a number next to them. An example would be a wolf, and it is weak to a sword strike. If the number next to the wolf is three, it would take three sword strikes to break through the wolf’s defenses, stunning the wolf, and allowing you to unload tons of damage. So balance is important here. Do you burn through your boost to break your enemy, or do you break and then boost to the max to unload tons of damage for the kill? This applies to every single battle, not allowing you to just spam attack. Magic works a bit different. When you boost, you don’t cast multiple spells, the damage just increases. Granted, there are more powerful spells that hit more than once, and they become key to the harder boss battles. 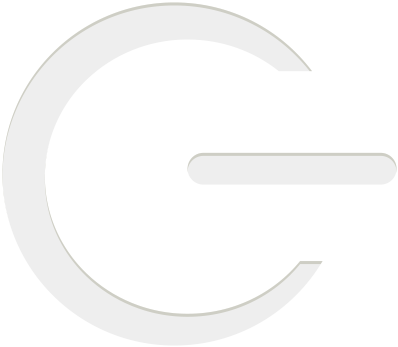 So did Acquire Games just ripoff Silicon Studio, who made Bravely Default? Not exactly. 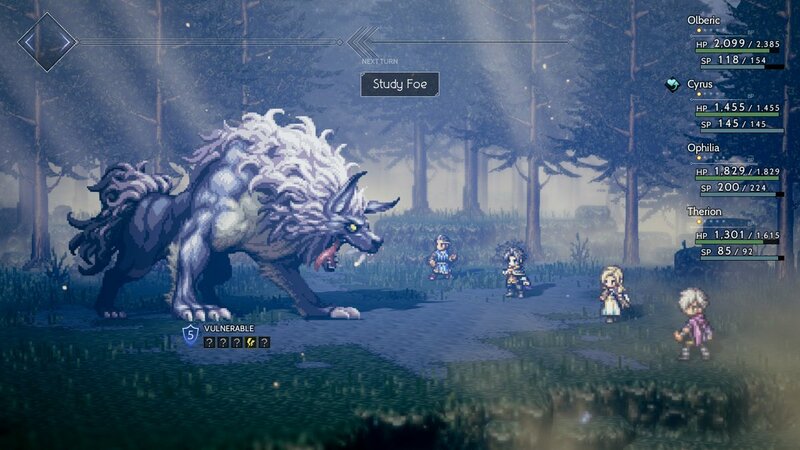 Silicon actually built Octopath from the ground up, but was later moved on to another project by Square, leaving Acquire to finish up the pieces. Luckily, everything came out just fine even after a studio switch. As I finish up Olberic’s first chapter, the world opens up a bit and I can travel to other areas. When you reach a town, you can fast travel back to that town, making things a bit easier to go back and forth. 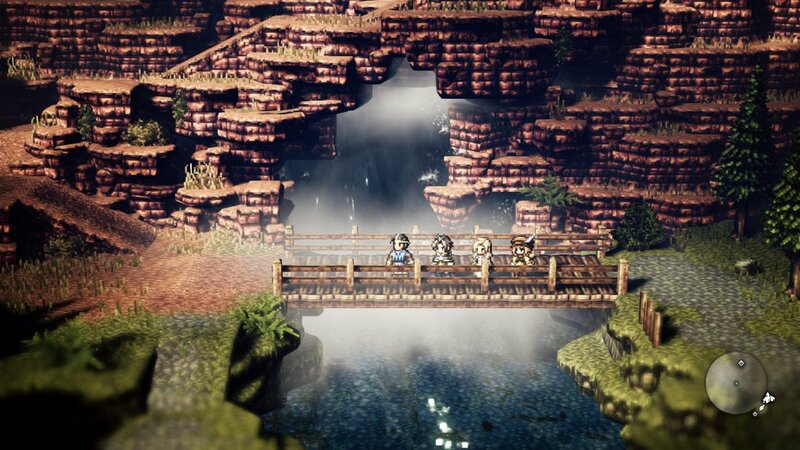 While Octopath is open world, certain places are blocked off for story progression, or the monsters are a far higher level than you. If you aren’t careful, regular battles can go awry real fast. Grinding is key here, and for the most part, I enjoyed leveling most of the characters. But you can only have four people in your party at a time, and in my case Olberic is locked to the party until I beat his story. And if you are like me, I had to finish everyone’s story, which meant a lot of grinding. Something else I love? Well, I’m a sucker for job systems, and this game has jobs! As you unlock parts of the map, you will come across caves that are shrines to each individual character’s job. So the shrine of the warrior, unlocks Olberic’s class for you to use on a different character. 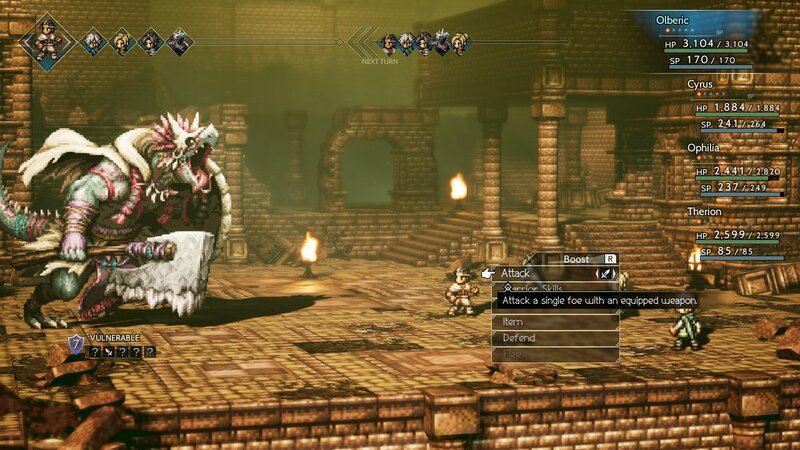 There are also caves to explore that will have you facing off with a tougher boss, leading you to four extra job classes that are really useful to have. As I’m hung up on our warrior here, let’s move to some other people and classes. Do I travel north, to the freezing cold to meet up with our Cleric named Ophilia, perhaps the scholar Cyrus in Atlasdam, or west to the desert to meet the Dancer Primrose? 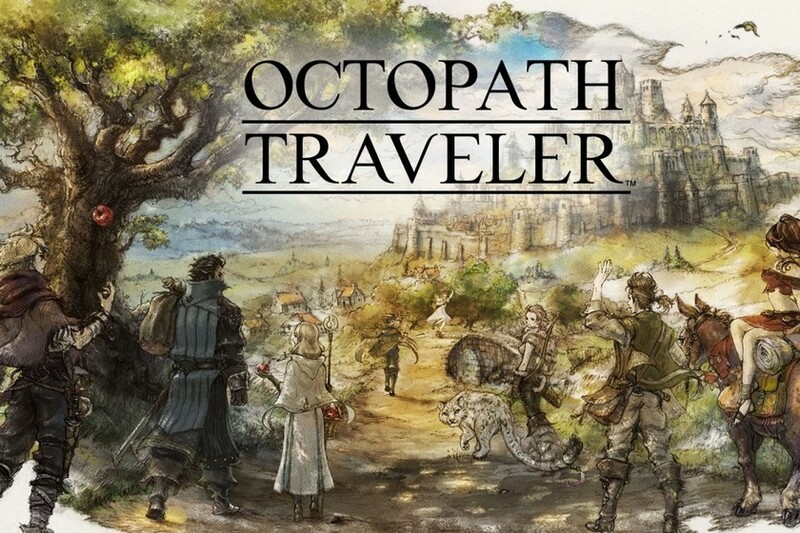 Well, seeing as how I had played the demo and already met Olberic and Primrose, I wanted to go somewhere new. North it is. Well, a bit at least, I wanted those offensive spells at my disposal, so I stop off to pick up Cyrus before Ophilia. The level of freedom is nice. As the scenery changes from mountains and beach sides, you really get to see the broader spectrum of what Square and company wanted to portray here. I’m playing a retro game, yet the landscapes are just breathtaking. Hearing the wind whip in the mountains, or the flowing blue water on the beach really made exploring a treat. Not to mention the soundtrack(more on that later)! As I reach Atlasdam, I see our scholar standing there, muttering to himself. I now have the option to help Cyrus, and to even play the beginning of his story, just like Oberic’s. The option is great, because if you are running through the game again, you can just pick up your characters and go, without seeing all the backstory. 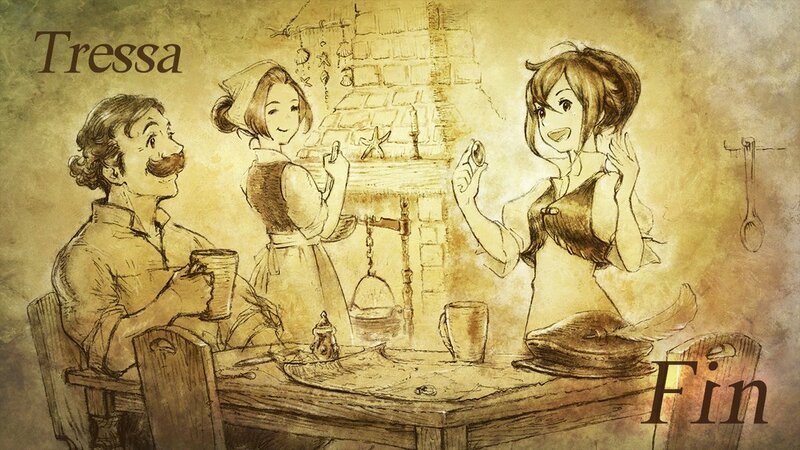 While Octopath’s story isn’t getting showered with praises, I really did enjoy the simplicity of it all. Adding another character made battles a bit easier, and now I am interested in Cyrus and how his story will play out. I must get them all. But now I see snow. Everywhere. It’s crystalline silence is a sight to behold, as I am battling monsters to make my way to Flamesgrace to meet up with our cleric. Most monsters are weak to fire here, so grabbing Cyrus seems like the right choice after all. Another intro, another boss to defeat, and I now have my healer. As I am traveling, I am seeing more and more monsters weak to weapons I can’t equip with anyone, so I know it’s time to get started on grabbing the rest of the characters, and unlocking their jobs via the shrines. Olberic can now equip an assortment of weapons, due to me giving him the subclass Hunter. On top of swords and spears, he can now equip axes and bows. He is starting to become a force to be reckoned with. As I go on, I pick up Therion the thief, and have my team of four. When I wasn’t grinding to finish another chapter, these were my main four. 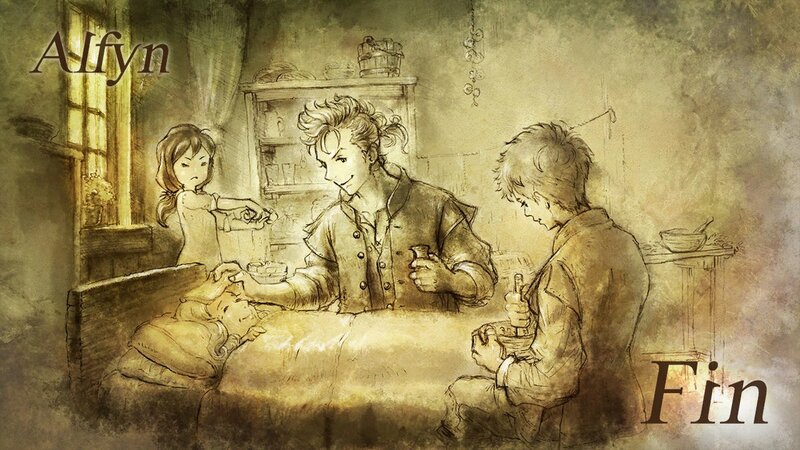 Olberic for sheer power, Cyrus for offensive spells, Opilia for healing and light damage, and Therion for speed and the ability to steal in and out of battle. Each character has a utility they can use that will benefit in different ways. Therion can rob people blind, with the bigger payoff being a very slim chance to obtain the item. Don’t want to steal? Well, Tressa, our young merchant can buy the items for a price. As money is a bit hard to come by early on, and most items and equipment being on the higher side of things, I just stole what I could with Therion. You have so many attempts in each area before you are cut off from using actions, only to go to the local pub and pay off the barkeep to restore your reputation. Sometimes it is a thousand, other times ten thousand! And with money hard to come by, you really have to be careful. I won’t lie, grabbing those crazy overpowered weapons early on became so costly, that I did reload a save or two. Or ten. I’m not proud of it, but I wanted those weapons! And they came in handy, especially when you have an under powered character. 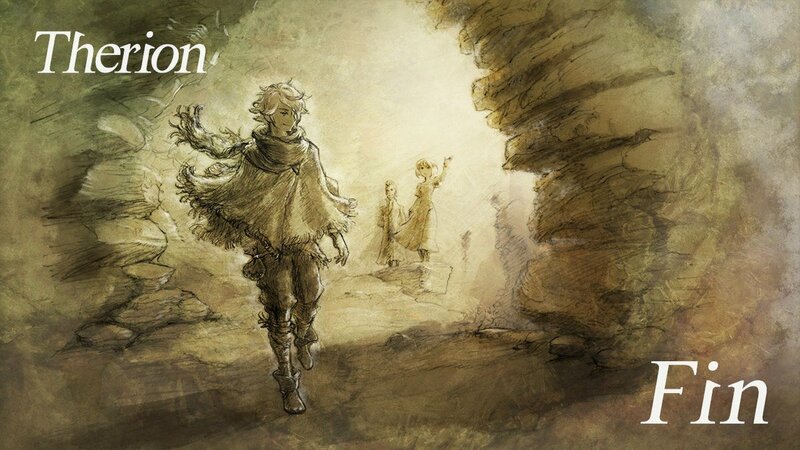 So for a short time, I would switch Therion out with someone else so I could move forward in their particular chapter. Sure, you could say leveling up only one newer character would waste a lot of time, but my main three were getting so much experience that they were far more powerful than most parts of the game. It was fun times. Smash everything to bits, even if Tressa wasn’t up to her recommended level for chapter three. That worked most of the time, except for when you were forced to fight solo, as the young hunter H’aanit had to do here and there. So I would try to grind a bit to make sure she could hold her own. 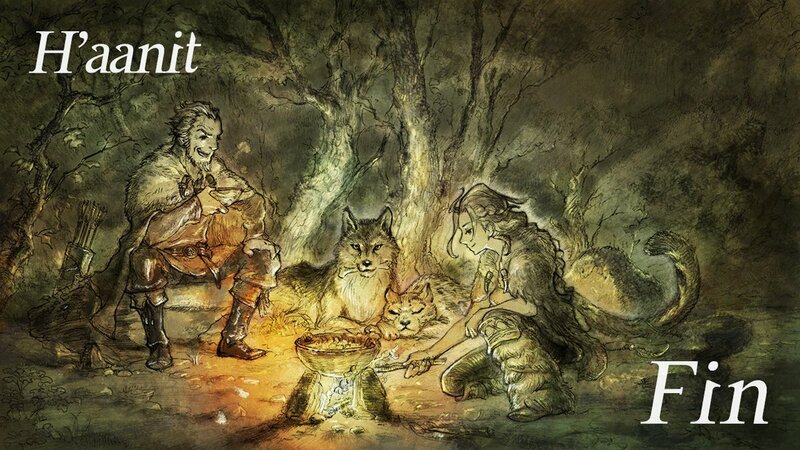 Ah yes, H’aanit. How dost thou not liken the hunten? 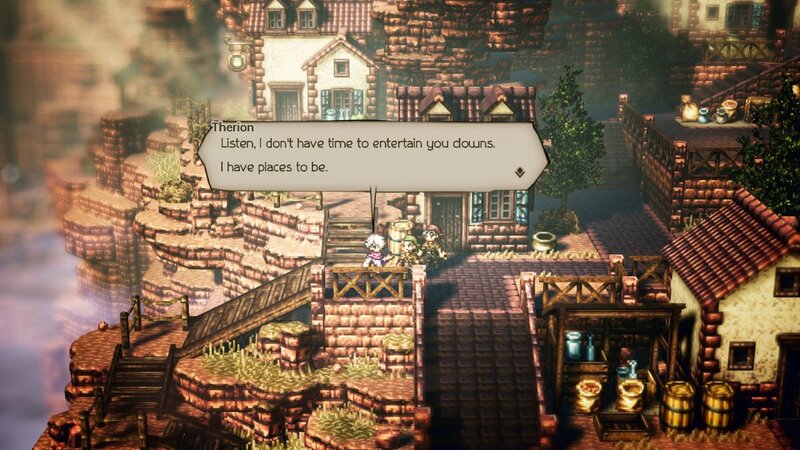 Yes, H’aanit and her village speak like this, and it is hilarious. But she is beyond deadly with her array of arrows, and a nice ability to capture monsters and use them in battle. 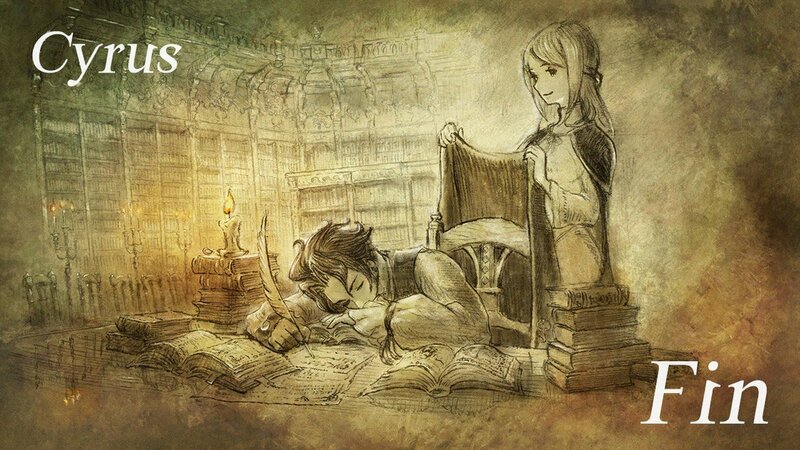 Or Alfyn, the apothecary. As a child, he falls deathly ill, only to have a wandering apothecary save him. This sets Alfyn on his path. See a trend here? Every character has a story, an ability, and it is their own. Even with the other characters present, they only interact with each other via optional cutscenes you can trigger, similar to the Tales series. While it wasn’t what I had hoped for, I get it. Let’s make each character follow similar guidelines, and explore, fight, use ability, rinse and repeat. While not perfect, it works. No, it doesn’t have the intricacy of Final Fantasy VI, where the dialogue between characters went really deep, and changed depending on who you had in your party, but honestly, not many do even at this day and age. Like I said, simple. And it unfolds just fine. But there are lines to look in between. 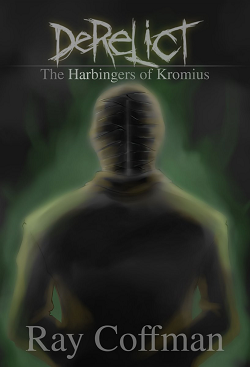 Some bosses will mention other happenings in the world, side quests will unfold and link between different characters. And even post game, you get to see how the villains all knew each other, or had grand plans to unlock a gate for something at the end. Did I mention the soundtrack? Because it is phenomenal. Yasunori Nishiki does a great job composing the game, and you can hear echos of games long past in more than a few tracks. I went out and bought the four disc soundtrack I enjoyed it so much. The sampler album that came with my Wayfarer’s Edition just didn’t cut it. Track names are even familiar, with the boss battles titled Decisive Battle 1 and 2. You will immediately get that old Final Fantasy vibe here. As the soundtrack is fully orchestrated, you get to hear an array of instruments, and almost every track is worth listening to. I find myself humming them just like I do many other games. After putting a good amount of hours into the game, it seems I have gotten everyone to their last chapter. Time to end this. After sixty-three hours of exploring, grinding, moving each character along, I have finally watched the conclusion of all eight characters. I won’t spoil anything, but I enjoyed most of them, some more than others, but each chapter held true to that old formula, and I felt really at home. After completing Olberic’s story, I can now switch him out of my party if I choose to. Which I don’t, by that time Olberic was almost unstoppable by himself and a little magic. As I stated, there is a final dungeon of sorts after you beat the game. But only after you complete some side quests that lead up to this climax. In between the lines I mentioned. I thought that was really cool, as most would put the game down, thinking the last blank part on the map might be future dlc. Do those side quests! As I neglected certain characters by not leveling them enough, I would have been in trouble, had a certain lady that works for a certain game shop not bothered to ask about my levels in the game. I won’t say why, but make sure all eight party members are ready to go for the post game content. So back to grinding. Which wasn’t bad at all, considering there are some great spots to earn experience and job points to unlock those all powerful skills pertaining to each class. Add another ten to twelve hours, and we now have a complete go of it. 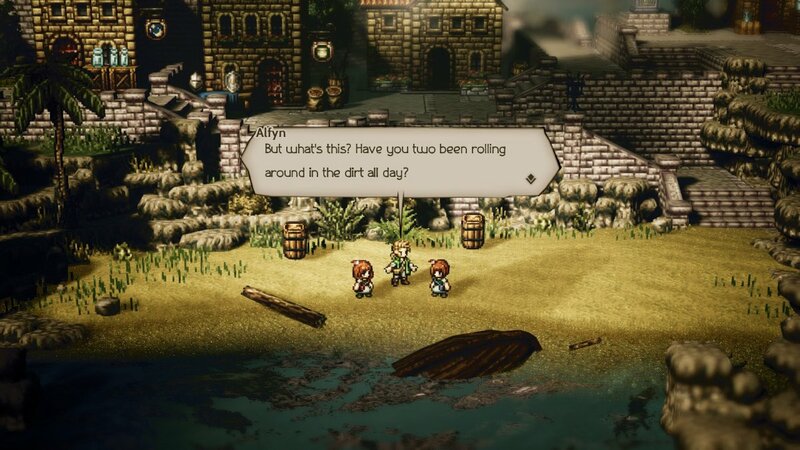 I did my best not to spoil anything for Octopath Traveler, as there is much to discuss, so I tried to be vague in some descriptions here and there. But there is some fun to be had, some moments that pay homage to other games(see Palom and Porom? ), and much more. The story could have been touched up a bit, but the entire package is one not to miss, and really feels at home on the Nintendo Switch. Oh, and in case you were wondering, I did rescue that boy from the bandits.